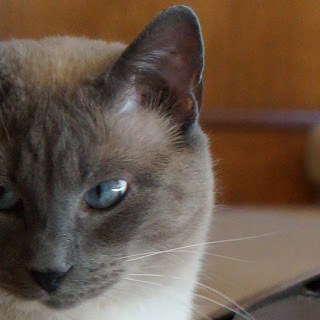 A few weeks ago, we talked about why the eyes of certain breeds like Siamese, Birman, Himalayan, and Tonkinese are blue. We showed cool diagrams and got to use nifty scientific terms and stuff. Mommy was in heaven. She's weird that way. 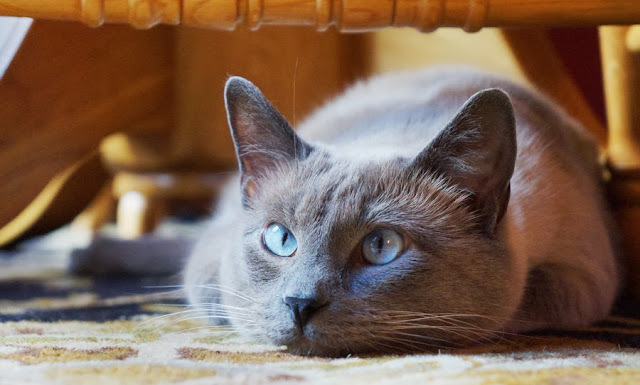 Today we're going to talk a bit about other things that can impact the way blue eyes look. The answer to that is yes...and no. If you see what appears to be different eye colors from photo to photo, that can be due in part to something called the angle of incidence. Say we're on location. The set is beautifully lit, with three cameras ready to film, positioned in a circle around the subject. All three are looking at the exact same scene, and all three can be "seeing" that scene's colors differently. The way the light hits the camera lens - and because what one camera sees in the background is different from what the other camera sees - it can make the shot look "off," color-wise. The cameras don't appear to match each other. But how can this be if the cameras are the exact same make and model, and they are set at the exact same settings, with the exact same lenses? Remember Raleigh scattering that we discussed in our post on December 9? Light bends, and it bounces. And because the cameras are in different positions, the angle of incidence of the light is different. And therefore the shot will look different. So we have to color correct - or "shade" - the cameras before we roll. Below is a perfect example of angle of incidence played out with Allie as the model. These photos were taken one right after the other, but the camera was moved almost halfway around in position between shot 1 and shot 2. What a difference it made in her eye color! This doesn't happen all that often with Allie. But with Faraday, and even more frequently with Maxwell, you'll see quite a bit of color shift. There's a lack of pigment to "anchor" the color, which means its appearance is more dependent upon those bouncy light rays. Color temperature can also impact what you see. Take a look at these two photos of Faraday. In the first, it's an overcast day so the lighting is flat and the camera "sees" Faraday's eyes as more blue-green. In fact, the entire photo is more blue in tone. In the second shot, he's inside on a sunny day, lit from the side. His eyes have more of a green cast to them. Maxwell's eyes - perhaps because of the complete lack of pigment - tend to vary the most. By the way, you can see the same phenomenon played out in the sky above you. You can have two completely cloudless days but one will have a much deeper "Colorado" blue sky than the other. Perhaps it has to do with air quality? More particles in the air (pollen, dust, etc) make for more scattering. One last point: lighter eyes will much more easily reflect their environment. 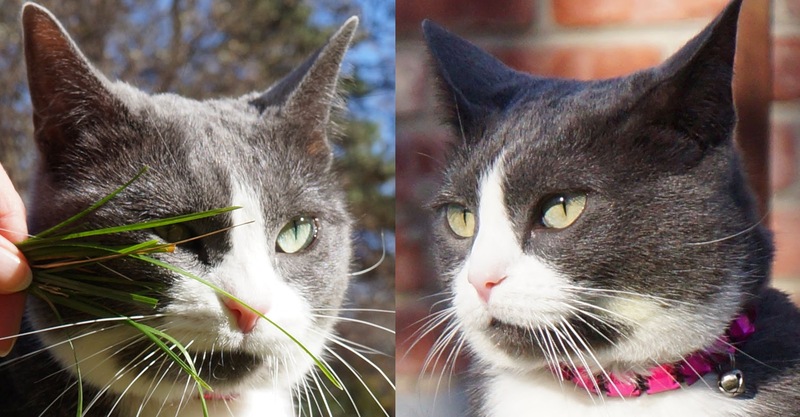 In the photo below, Faraday is surrounded by green leaves, and you can see that green reflected in his eyes. And in Maxwell's photo, the eye closest to the table is reflecting some of the golden tones of the wood back into his eye. Again, none of these photos were retouched or color corrected. This is how they look raw, straight from the camera. So to answer the question occasionally posed, do I "bump up the saturation" in Maxwell's eyes? Sometimes. As all photographers will do, I color correct my photos before publishing, to "normalize" them. To make sure skin (ahem, fur) tones are correct and not too ruddy or blue. And to make sure eye tone isn't too "off" from the way they normally look. That camera shot above in Jewel's kitchen? 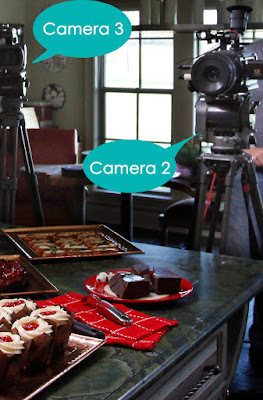 Here's the final video - it's one in a series of 26 tips we filmed with Jewel, food blogger Jaden Hair and the star of "My Fair Wedding," David Tutera. 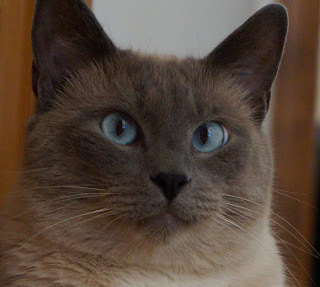 Mom is always amazed at how our Birman girls eye color changes!! Great explanation! We love the examples to explain the differences in how pigment makes a difference. Wow. I see why using multiple cameras can be super helpful. We can really see it with Faraday. Cool post today. Awesome explanation of how every photo I take seems to be different! Both Katie's and Waffles' eyes change so much based on the time of day, the lighting, even the furniture in the room. And you're absolutely right...I don't know a single photographer that does't "post process" their images. The most common adjustments I make are like what you did in that last photo of Max. So often a photo will look dark and almost dull...especially when shot inside. With just a little tweaking, it's easy to make it look how it REALLY looked when you took the photo. Keep the science posts coming! Can you make it get rid of all these crazy comments I apparently made??? A very informative piece, I sometimes use auto correct on Irfanview, but it often seems to make the colours too strong. My human was so entranced by the thought of chocolate shavings and black walnut cupcakes with that frosting and cherry garnish that she almost forgot completely about the light explanation! But yeah, it's something she is already aware of, and she is constantly adjusting our photos and trying to make the color casts all match in the same post... although she is not always successful. Very interesting! We notice that in different lighting our eyes take on different color...sometimes more gold, sometimes with a little green. Being that mine Mom eyes sometimes changes colors depending on what she wears this was informative and much more cute to see how light reflects in different ways to produce colors. Mes just loves all this scientific stuff! Interesting, very interesting. Äiti is torn between pondering the physics and just adoring the eyes. Beautiful photos of you guys! Wow, what a fascinating post! It is so interesting how much Faraday's eye color can vary. Your photographs are always so beautiful.